This uber cool destination is so accessible from the UK. The glorious north is our favourite bit of the island as it is slightly more undiscovered and away from the hectic crowd-filled beaches and bars of the south (altho’ it would be a shame not to have a quick peek at all those beautiful people!). With its hippy markets, international restaurants and beaches Ibiza never fails to impress those who visit for the first time. It has attracted a very eclectic bunch since the 60s when the first hippies arrived. From simple organic fare for the children to delicious fresh salads & awe-inspiring dishes by International chefs, there is a bit of everything here. The island is humming with fabulous restaurants - chefs have migrated here from Paris, London and New York. Due to the high standards that have been set in recent years the restaurants get better and better. There are excellent Spanish staples including gazpacho, croquetas and paella as well as Ibizan dishes such as Zarzuela and Sofrit Pages (a spicy stew). There are many organic farms in the interior of the island ensuring that the restaurants are stocked with the very best ingredients. If you’ve never tried a Spanish vodka and tonic we suggest you charge yourself... the jota b and coke is a favourite among the young. The cocktails are strong but oh so good. Wonderful hippy markets have been on the island since the early 1970’s. Beaches to die for: the crystal clear waters at Es Cana, Cala Llonga and Playa d’en Bossa will leave you entranced. Diving the coral reef in Ibiza is an experience not to be missed. There are diving lessons at the excellent diving school in Portinax. Watch the sunrise come up from the dazzling, open air dance floors...or just dance all day. Frankly, day is night and...night is day. There is a good choice of different golf clubs on the island, good for all standards. There is so much for children to do in the day, some restaurants have fabulous creches so that the children are just as happy as you. If it’s nightlife you’re after, you’ve come to the right place: top clubs, famous djs, hot bands, a cosmopolitan mix of clubbers, local residents, freaks, mature partygoers, fresh faces, and the full alphabet of celebrities. But equally stay up north and just enjoy the gentle sound of hippy drums on moonlit beaches in contrast to the crazy south of the island. Dance until dawn wherever you are on the island and finish your night with chocolate and churros as you wander home. Watching the sun rise and set into the sea is a favourite pastime in Ibiza. However, you mustn’t leave the island without your fair share of oggling the people, spend the day at the Blue Marlin Cafe or The Jockey Club and just stare! Es Vedra, the rock in the south, is just off the coast and looks just beautiful day or night. There is loads laid on for children with many restaurants running creches so that you grown ups can enjoy a nice long lunch. There’s some culture in Ibiza town which has a very old centre. Ibiza is famous for many things but clubbing is one of its most infamous. 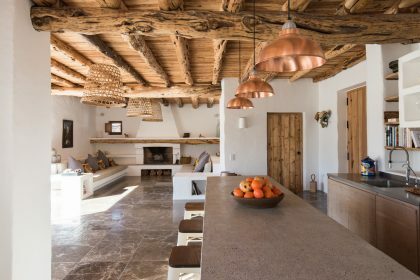 We love the more relaxed side to the island, drumming on the beaches in the north at sunset, shopping at the hippy markets or taking a boat trip over to Formentera and hanging out on the beaches there. Ibiza is a melting pot of celebrities including Jade Jagger, Kate Moss and Daisy Lowe. It has always attracted beautiful people from Errol Flynn to Katie Price. Sienna Miller is a regular with Jude Law. The Spanish celebrities love it too with Penelope Cruz often there on holiday. Sly Stallone is a big fan and others papped in their bikinis include Kylie, Keira Knightly and Liz Hurley.